Recently the testing regulations and grading systems used for determining how safe a vehicle is on the road have become more difficult and stringent. Automakers that have embraced the inclusion of advanced safety technology on the road have been recognized and given higher grades, especially when automatic emergency braking has been installed and is an option that can be had in the vehicle you choose. As more technology is added to more models in the automotive world, the safety is being increased but one segment of the market feels like it’s been left out of the equation of some automakers. There were eight mid-size pickup trucks that were recently tested by the IIHS to see how they could score in the test. Of these eight four of them received good ratings for occupant protection in all five of the crash tests that are conducted. While these vehicles are perfectly capable of protecting those inside the fact is the lace of automatic emergency braking and headlights that are rated as poor make it difficult for these vehicles to grade out at a level that would put them in the area of offering low to poor ratings overall. While the top performer in the class was the Toyota Tacoma Double Cab because this truck received a good rating in the small overlap test. 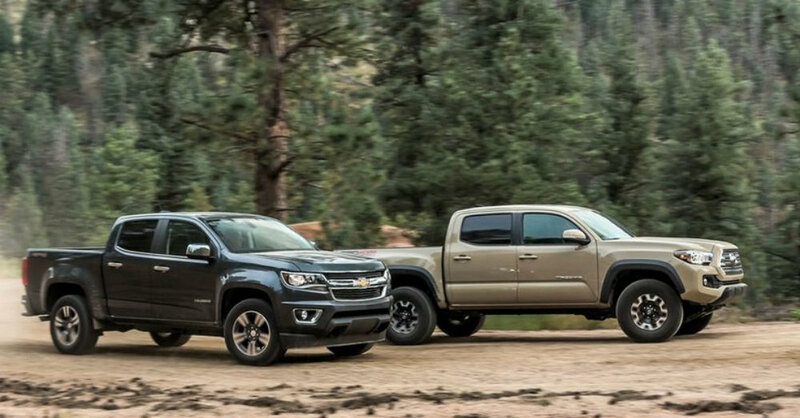 The Chevrolet Crew Cab and GMC Canyon Crew Cab both earned good ratings for occupant protection in this same test while the extended cab models of both GM produces received acceptable ratings. Even with these crash test ratings that allow the trucks to be rated better than most other models, the overall rating still came out lower than they should be because of the headlights that are rated poorly overall and don’t give the visibility you want. Of the eight pickup trucks that were tested, two of the models that are also the most recent additions to the market were the ones that had the highest overall rating. The Chevrolet Colorado and GMC Canyon both came in with a basic rating for front crash prevention because both are offered with the optional forward collision warning system. None of the other trucks in this test has the same results or offered any of the grades that would make it possible for them to stand up and be offered as the models that you would want to drive. The bottom line is the fact that the mid-size pickup truck market needs to bring in the benefits of automatic emergency braking in these trucks. The GM models are the closest to offering this already but the fact that these are the trucks used more widely for the weekend warrior and as a daily ride for the family, these trucks should be equipped in a similar fashion to the sedans and SUVs offered from the same brands. Right now, the GMC Canyon and Chevrolet Colorado are the two that offer the most safety in this truck class. I enjoy Design and Architecture. This includes cars, I have always loved the design of a vehicle and it is what led me to work in the Automotive Industry at Honda. I'm also a freelance automotive journalist.